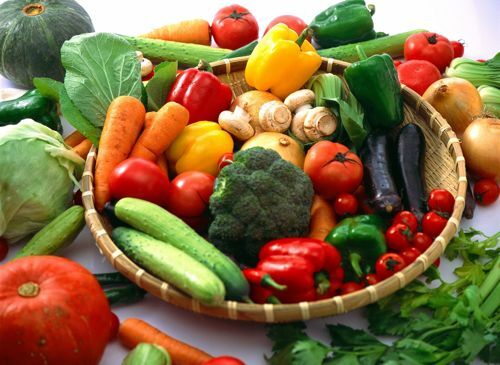 Vegetables form an exceedingly important part of your diet, providing several health benefits and reducing the risk of various diseases, including diabetes, cancers and cardiovascular issues. Studies by the Department of Health and Human Services and USDA show that increasing vegetable intake has positive effects, and there are several vegetables that can be consumed raw. Consumption of vegetables is essential in order to receive nutrients like folic acid, antioxidants, vitamins, minerals and fiber. According to the report by the USDA and HHS, it is important that you take about 5 to 13 servings of fruits and vegetables every day and the easiest way to do so is to prepare snacks using both. Salads can serve as excellent snacks for work and home, and are generally low-calorie foods with high concentration of nutrients. Green vegetables, including cucumbers, spinach and green peppers can easily be taken raw. Their color is a result of chlorophyll, which is naturally found in plants. These vegetables contain lutein, which is found to lower macular degeneration risks. Moreover, leafy vegetables like broccoli and spinach are excellent sources of folic acid, while other greens like lettuce, avocados and beet greens have essential nutrients. Red vegetables get their color from polyphenols, which are very potent antioxidants and include lycopene and anthocyanin. Tomatoes are perfect examples of red vegetables (even though they are technically fruits, they are generally considered with vegetables) and according to the Harvard School of Public Health, red vegetables supply the body with vitamin A, which is very effective against prostate, lung and mouth cancers. Red bell peppers, red cabbage and radishes are also popular red vegetables which can be consumed raw. Like polyphenols are responsible for the red color in red vegetables, the orange and yellow ones are colored as such due to the presence of carotenoids. For this category, carrots are good examples, and can easily be consumed raw. The beta-carotene from carrots is also used by the body to produce vitamin A, alongside benefiting the immune system, sight and mucous membranes. Other orange and yellow vegetables which can be consumed raw include yellow peppers, squash and yellow tomatoes. Onions and garlic are good examples of white vegetables, and typically contain allicin, which is a compound that helps with blood pressure and cholesterol related issues, alongside reducing the risk of cardiac and stomach issues. While these can also be consumed raw, they often leave very strong smells and are generally avoided in their raw forms.